What a strange dichotomy was last night’s ratings…..
My Kitchen Rules fell to a new all-time low at 1.02m viewers -yet it was still enough to top the night, which underlines just how high it has indeed ruled over the years. It was also the only show over the magic million. Only one show hindered a clean sweep: A Current Affair winning with 794,000 viewers. I’m a Celebrity Get Me Out of Here had its best night of the week at 787,000 and rising to 850,000 for the elimination of Lisa Curry, beating Planet Earth II. Seven’s Murder Uncovered held strong with an extended outing, well ahead of Murder Calls. 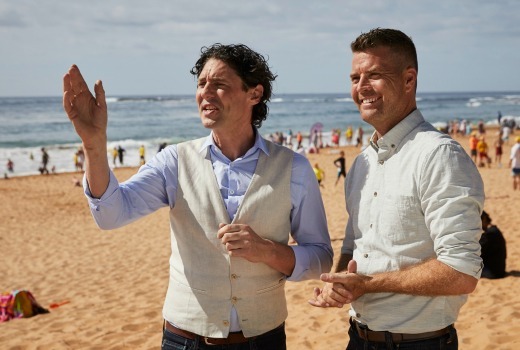 Over on ABC it was a soft night, with The Weekly their best in entertainment, down slightly on 480,000 viewers, while SBS matched its Tuesday share. Seven network easily won Wednesday with 32.5% then Nine 26.8%, TEN 19.3%, ABC 14.3% and SBS 7.1%. My Kitchen Rules was #1 for Seven with 1.02m then Seven News (941,000 / 924,000), Home and Away (724,000), Murder Uncovered (656,000 / 652,000) and The Chase (517,000 / 338,000). Surveillance Oz was 329,000. Nine News (923,000 / 911,000) led for Nine then A Current Affair (794,000), Planet Earth II (678,000), Murder Calls Australia (501,000) and Hot Seat (435,000 / 280,000). Mafia Women was 223,000. I’m a Celebrity Get Me Out of Here drew 787,000 and rose to 850,000 for the elimination. The Project was 537,000 / 304,000, This is Us was 501,000, TEN Eyewitness News was 455,000 and Madam Secretary was 210,000. ABC News (656,000), The Weekly with Charlie Pickering (480,000), 7:30 (470,000), Julia Zemiro’s Home Delivery (448,000), Walliams and Friend (272,000) and Adam Hills: The Last Leg (248,000) comprised ABC’s night. On SBS it was Tony Robinson Down Under (281,000), The Eighties (279,000), Vikings (225,000) and SBS World News (144,000). Shaun the Sheep still rules multichannels with 212,000 viewers. Because Queensland doesn’t have Daylight saving, the Nine network statewide drops ” Current Affair’ on Thursdays and Fridays to go to Rugby League coverage. Because 6.30 pm here is 7.30pm in NSW. This must have an effect on ratings nationally, mustn’t it, losing a whole state? The situation will correct itself with the end of DS early April. Meanwhile, if desperate we can watch it on Nine’s ‘catch up’ service. (I’m not that desperate). The Weekly is shown on 3 nights each week plus iView, Julia Zemiro on 2 nights plus iView, so consolidated figures would be higher. 7Two burned off 3 eps of Murdoch last night, none next week, bye bye for a while. Only 7 seasons to go. Farewell to King Ecbert, and to Helga, Vikings so far has worked without Ragnar – hopefully it’ll continue to do so. So that means that roughly 19 million people in Australia have other things to rather than watch TV, the stations must be cursing this extended summer we’re having with nice evenings to be outdoors then. Where did you get the 19 million number from? OzTam don’t count people wearing nappies. You’d be surprised by the number of shift workers in our casualised workforce. This has resulted in proportionally fewer children (under 15 years of age) in the population and a proportionally larger increase in those aged 65 and over. I can’t wait for MKR to drop below the 1 million mark. Is the issue with MKR viewer fatigue? or is this season just dull? Gogglebox rips into it this week. If you like bullies and nasty people it’s great….better than ever, if like me you watch for the cooking then it’s very annoying……I have watched this show since the beginning but they have lost me. Watching Masterchef Professional on Foxtel instead and can’t wait for Masterchef Australia to begin. Oh you were expecting a cooking show were you? Silly! I’m bored with MKR now. Too many challenges and I can’t remember who am one is! Last two nights been more MasterChef than MKR, even down to “Step away from your benches”. So that means Home & Away drew fewer viewers than that. After almost 30 years perhaps H&A is approaching its use-by date? There were rumours late last year that 2017 could be its swan song if things didn’t pick up. Looks like its heading that way. The show has completely moved away from its original premise of troubled teens in a half-way house. These days it is just like any other drama. The constant killing off of characters to introduce new blood indicates the producers are desperate. H&A figure is in the post. Second in its slot hardly makes it ripe for the axe. H&A also seems to do well in time shifted viewing. Seven would still be happy with its performance. Couldn’t Agree more. I don’t like it when 3 channels decide to split in 30 min intervals. Too much waste of space. UK and other markets won’t let it go. Just like Neighbours. Apart from the ABC news, everything else we watched was on catch-up. Nothing else on free to air TV last night appealed to us.